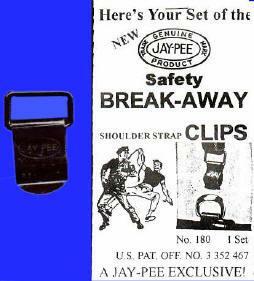 Break Away Clips for Shoulder Straps from JayPee | 700109, COURTLAND BOOT JACK COMPANY, Break Away Clips for Shoulder Straps from JayPee | McDonald Uniforms, Inc. 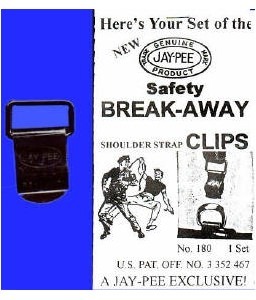 Protect yourself with JayPee patented break-away clips for your shoulder (Sam Browne) straps. A sharp or heavy pull on the strap quickly separates strap from belt. Fits standard D-rings. The use of break-away clips add 1.5" to strap length.